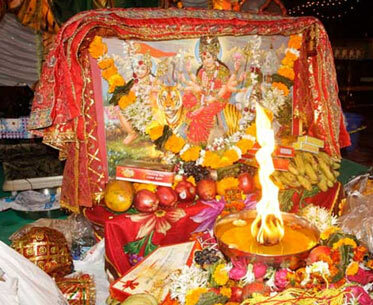 Information on How to Celebrate Navratri festival including puja, fasting, rituals, kanya puja is presented here. How to Celebrate Navratri - The fanfare associated with Navratri celebration has a distinct flavour. While very few Hindu festivals can match the scale and fervor of Navratri, this nine nights festival singularly opens you up to new festive experiences. While puja and fasting rituals mark the day, the evenings are for exulting in the dancing thrills. Marking the onset of summer, Chaitra Navratri is held in March/April while Sharad Navratri, which is the more popular one, is held in September/October. During this festival, Ma Shakti is invoked in all of her nine forms or incarnations. She is also known as 'Amba', 'Annapurna', 'Drakali', 'Sarvamangala', 'Bhairavi', 'Chandi', 'Lalita', 'Bhavani' and 'Mookambika'. Broadly, the nine days are dedicated to venerating Goddess Durga, Goddess Lakshmi and Goddess Saraswati to seek divine grace, knowledge and power. The tenth day or 'Vijayadashami' is celebrated to establish the importance of goodness with joyous participation. This nine nights festival is very holistic in approach, as fasting for spiritual cleansing is well-complemented by participation in chants, songs and dance. Sustaining only on fruits and milk for the entire fasting period. Involving yourself in prayer or 'prarthana' and long meditation sessions. Keeping awake all night and participating in 'bhajans' along with family members. Keeping the mind focused on spiritual activities by reading 'Durga Shaptashati' and listening to 'vrat katha' or stories/episodes relating to the nine forms of Ma Durga. Wearing different colors each day to honour Ma Durga's nine forms, such as red on the first day. Tying a garland of fresh flowers every day to the idol/photograph of Maa Durga. Doing charity which includes donating food to the needy. Thinking pure thoughts during the auspicious period. Eating only one meal a day, a vegetarian preparation without onion and garlic. Lighting 'Akhand Jyot' or a constantly burning 'oil lamp' in front of Goddess Durga's idol or picture for the entire period. Planting nine varieties of food grains to appease the nine planets. Performing 'arti' in front of the idol/photograph of Ma Durga. Abstaining from wearing leather shoes, shaving, paring nails or cutting hair during this period. Avoiding wearing black colored clothes. Inviting married women and seeing them off with auspicious betel nuts and coconut. Honoring Durga Ma's nine forms by worshipping nine girls and preparing special meal for them. Coinciding the day of starting new ventures or new purchases with Ashtami (eighth day)/Navami(ninth day). Choosing to fast only on the first, fourth and seventh day of Navratri festival. Besides the above, a devotee can choose to not continue fasting during Navratri if for some reason he/she is not able to do so.